Below a part-image from www.seaice.dk and originating from the NOAA Polar Orbiter satellite's measurements of radiated heat, which provides pictures of the sea ice, as well as water vapor. The animation further below uses many such images and starts with five daily images showing a red area in the bay off the coast of Tiksi starting November 1, 2011. The animation continues to February 16, 2012, i.e. the last date for which images were made available when this post was written. 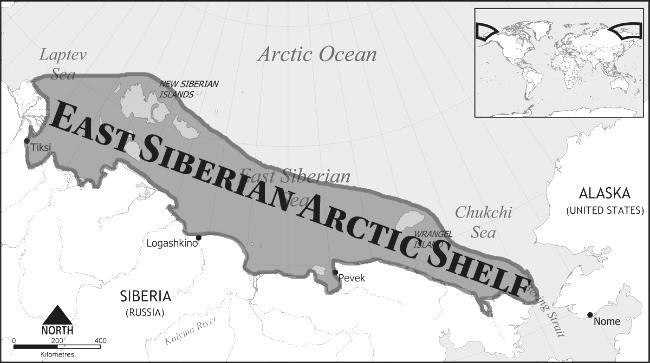 Large red areas show up end 2011 (particularly from November 25 till December 6) off the coast of Siberia, matching up with the dates mentioned in the earlier post Abrupt release of methane in the Arctic in late 2011. From the very end of 2011, red areas also show up in the North of Canada. Since methane has a very high immediate greenhouse effect, the heat detected on the images could well originate from methane releases. Furthermore, one of the indirect effects of methane releases is production of water vapor, which also has a strong greenhouse effect. Therefore, the red areas could well be seen as indications of methane releases. Matching images like this minute by minute with AIRS images of methane could give a valuable insight in the contribution of methane to warming in the Arctic. Below is the animation. Click on Read more if you don't see it. Note that this is a 17.7 MB file. It may take some time for the animation to fully load. Much of the Arctic is showing huge temperature anomalies at the moment. 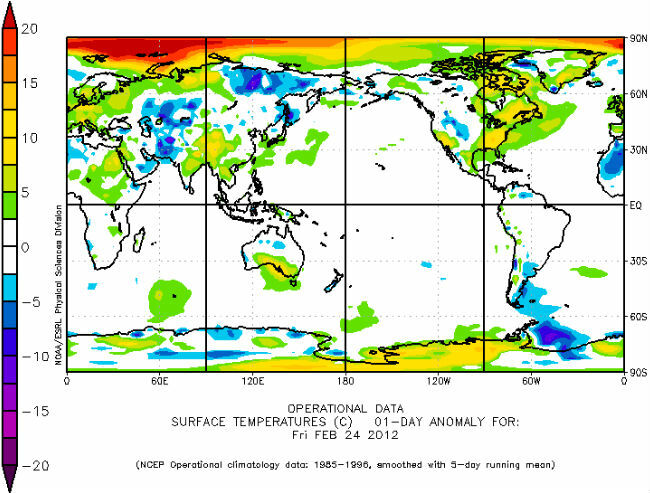 The image below shows the anomalies for February 24, 2012. Locations in the Arctic have been showing temperature anomalies of over 20 degrees Celsius since late 2011. As the above image illustrates, the anomalies are centered around the 60 degrees East longitude, and they are most prominent between latitudes 75 North and 80 North, i.e. 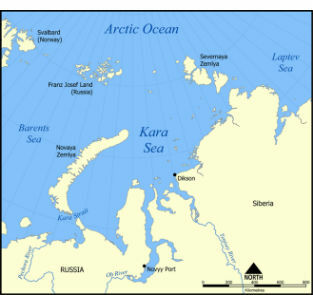 the area between Novaya Zemlya and Franz Josef Land, as shown on the map below. Not surprisingly, there's little sea ice in the area. 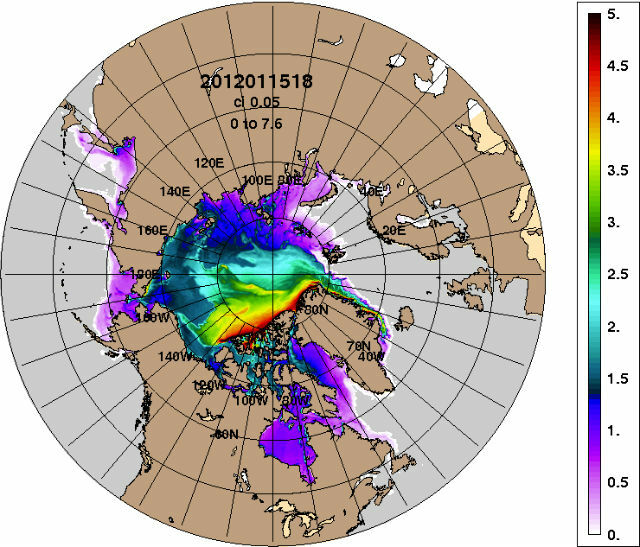 The image below shows the sea ice as at January 15, 2012. The animated image below, from U.S. Naval Research Lab showing the sea ice's thickness in February 2012, illustrates the retreat of the sea ice between Novaya Zemlya and Franz Josef Land in February 2012. The animation also illustrates that much of the sea ice is moving along with the sea current, flowing out of the Arctic Ocean along the edges of Greenland into the Atlantic Ocean. Click on Read more if you don't see the animation. The animation is a 800 kb file that may take some time to fully load. 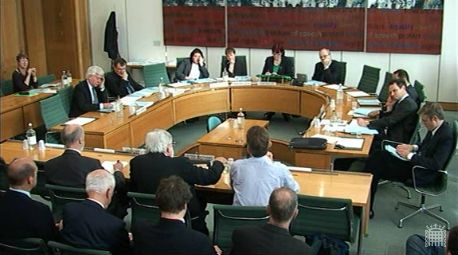 The meeting started at 2.12pm and ended at 4.08pm. The video below starts with a presentation by Professor Tim Lenton, University of Exeter, who is not a member of the Arctic Methane Emergency Group. The video further features Professor Peter Wadhams, University of Cambridge, and John Nissen, Chair, Arctic Methane Emergency Group. Click on Read More if you don't see the video (it may take some time for the video to start), the transcript and written submission below. Abrupt release of methane in the Arctic in late 2011? 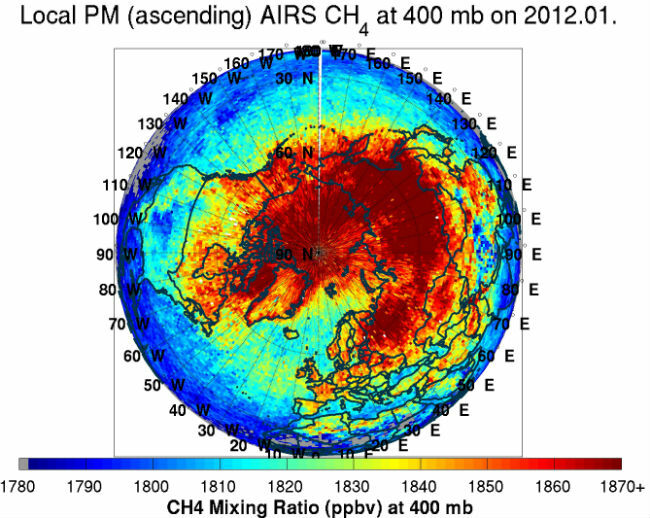 Was over 2 Megaton of methane released abruptly from hydrates in the Arctic in late 2011? Satellite images show high levels of methane at various locations in the Arctic over a period of 13 days (November 26, 2011, to December 8, 2011). Methane was observed at various locations in the Arctic at levels of about 2000 parts per billion. Global levels are about 1820 parts per billion. 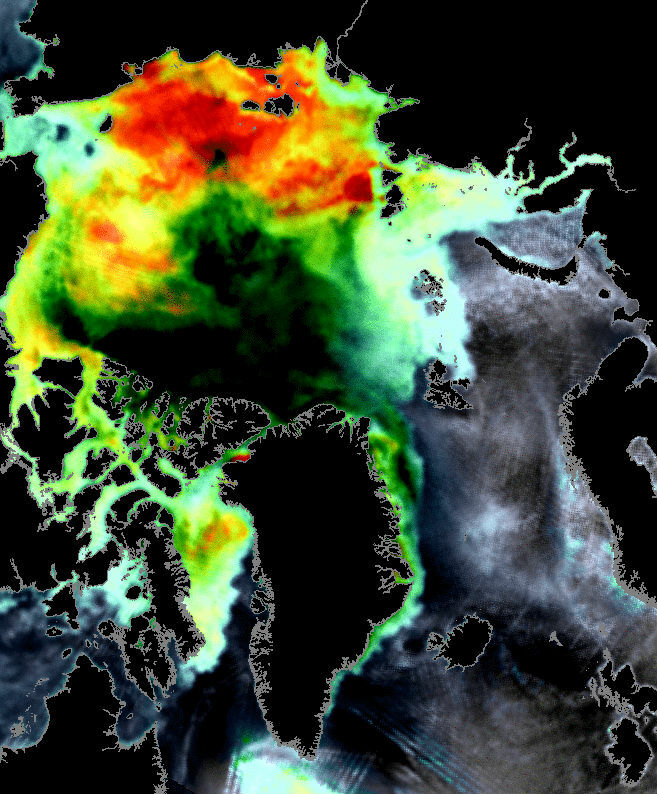 What could have caused these high levels in the Arctic? There are no natural gas pipes at the North Pole that could be leaking, there are no drilling activities taking place, and there are no cows or termites. Since it was winter at the time, there were no algae blooms. The best way to explain these high levels of methane at the North Pole is that was venting from hydrates at the North Pole and carried by the wind into North America. In which direction would methane flow? 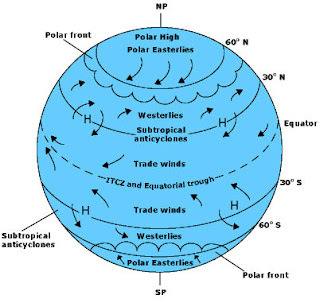 Polar easterlies are the prevailing wind patterns in the Arctic. When methane emerges at surface levels in the Arctic, these winds will drive it down to 60 degrees North latitude, where it will be further dispersed by the Polar Jet Stream (or Polar front). How fast can methane be carried by the wind? In the Arctic, winds have average speeds of 600 to 1032 kilometers per day on the Atlantic side in winter, while maximum wind speeds in the Atlantic region can approach 4320 kilometers per day in winter (Rajmund Przybylak, 2003: The Climate of the Arctic). 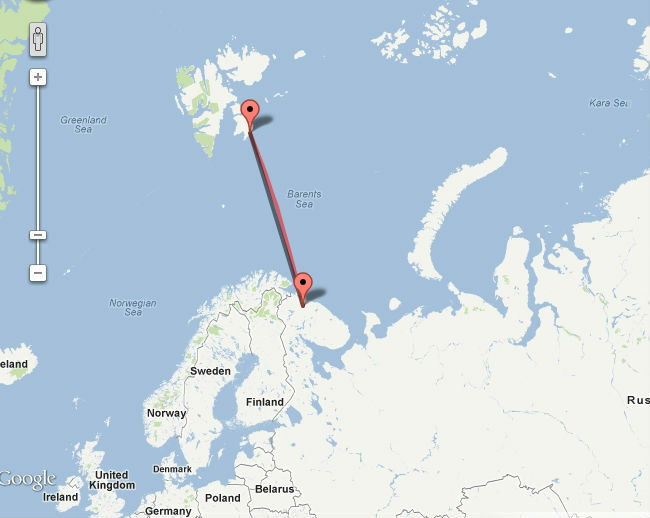 By comparison, the distance between Murmansk and Svalbard is about 1000 km (621 miles), as illustrated on the above map. The animation below shows daily satellite pictures of methane descending down the Arctic, from the North Pole into North America over a period of 13 days (November 26, 2011, to December 8, 2011). Distances traveled daily appear to match average wind speeds for the respective area at this time of the year. Note: This is a 2.17 MB file; it may take some time for the animation to fully load. In conclusion, the animation suggests that methane is venting from hydrates in the Arctic at levels up to 2000 parts per billion. These high levels can cover areas as large as Greenland. Total surface of Earth is 510,072,000 square kilometers, and Greenland has a surface of 2,166,086 square kilometers, one 235th that of Earth. The total methane burden on Earth is about 5 Gt, corresponding with a level of 1820 parts per billion. Thus the burden over an area the size of Greenland would be one 235th of 5 Gigaton, or 21 Megaton. A level of 2000 parts per billion is about ten percent higher than the world's average level of 1820 parts per billion. Thus, the methane that shows up in the animation could result from abrupt release of some 2.1 Megaton of methane from hydrates in the Arctic. 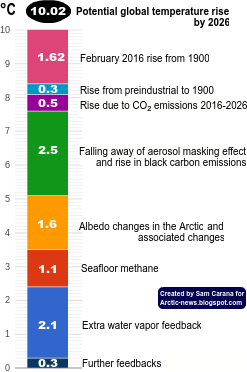 The Arctic methane threat is featured at Radio Ecoshock. Or, go to ARCTIC EMERGENCY Global Threat, and hear the audio while viewing more background. Above chart, based on historic NASA land-surface air temperature anomaly data (see interactive map at the bottom of this page), shows that the average temperature anomaly rise in the Arctic (latitude 64 and higher) looks set to reach 10°C within decades. These anomalies are based on annual averages that are also averaged over a huge area. The NASA image on the left shows temperature anomalies of over 10°C for the month December 2011. More detailed analysis shows that, over December 2011, the highest average temperature anomaly (12.8933°C) was recorded in the Kara Sea (latitudes 79 - 81 and longitudes 73 - 89). NOAA daily data show even more prominent anomalies, especially for the area from the Kara Sea over Franz Josef Land to Svalbard (see Wikipedia image left). 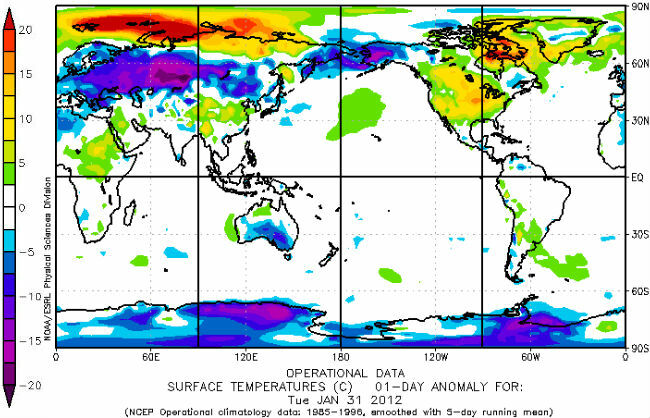 NOAA temperature anomalies for January 31, 2012, seem typical for the over 20°C anomalies that this area has experienced over the period December 7, 2011, to February 11, 2012. How is it possible for this specific area to show such huge temperature anomalies? 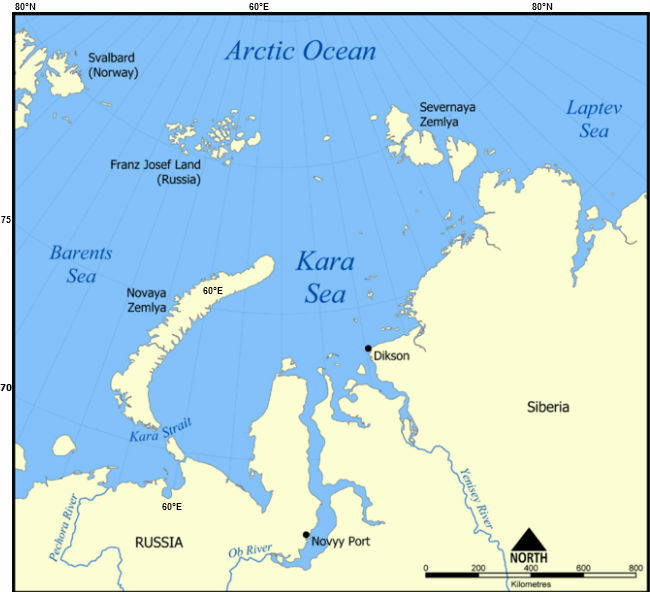 Could it be that warm water from rivers flows into the Kara Sea and is transferred to the atmosphere in this area? This seems unlikely, given that it is winter, while the mainland does not appear to be suffering similar temperature anomalies. The NOAA map below with anomalies for water temperatures (at surface level) also shows no particular anomalies for the Kara Sea. 2. Warm water from the Atlantic Ocean? 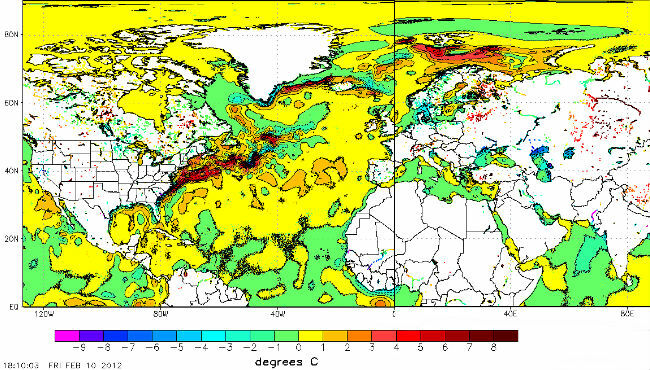 Above image shows that the water surface temperature anomalies are most prominent just north of Scandinavia. 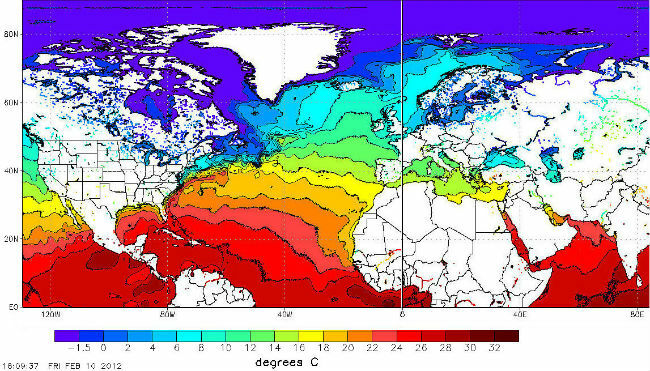 The reason for this is that thermohaline circulation is pushing warm water from the Atlantic Ocean into the Arctic Ocean, as evident when looking at actual water temperatures (image below). As above image shows, warm water from the Atlantic Ocean hasn't (yet) penetrated the Kara Sea, which makes sense in winter. Therefore, this also seems an unlikely candidate to explain the over 20°C air surface temperature anomalies in the area stretching from the Kara Sea over Franz Josef Land to Svalbard. A third possibility is that methane is venting from hydrates in the Arctic and is spread by the wind around the Arctic. 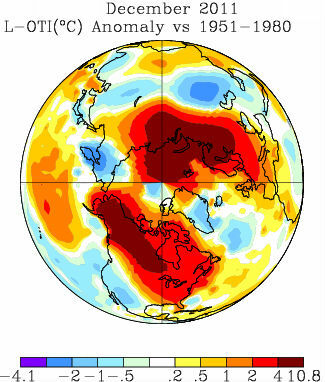 This would explain the record methane level of 1870+ reached in the Arctic for January 2012, as shown on the image below. Particularly worrying is that this methane continues to rise. 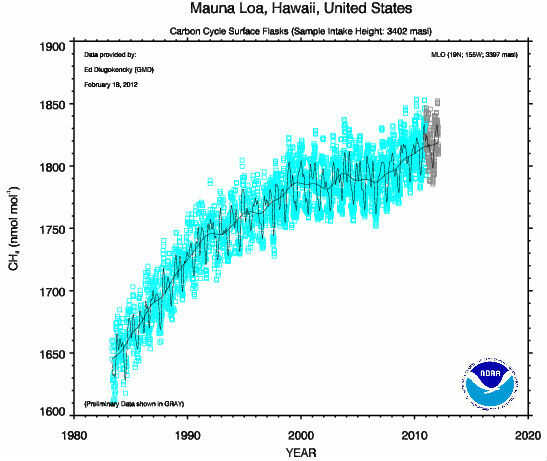 In the past, methane concentrations have fluctuated up and down in line with the seasons. Over the past seven months, however, methane has shown steady growth in the Arctic. Such a long continuous period of growth is unprecedented, the more so as it takes place in winter, when vegetation growth and algae bloom is minimal. The most obvious explanation for both the temperature anomalies in the Arctic and above image is that the methane is venting from hydrates in the Arctic. The area of the Kara Sea, Franz Josef Land and Svalbard shows temperature anomalies of over 20 degrees Celsius. How can such anomalies be explained? Above animation is a 4.7MB file. It may take some time for the animation to fully load. It covers the period December 7, 2011, to February 11, 2012.
seeping structures more than 1,000 meters in diameter. It's amazing." In the first sentence of his Jan. 4 entry on the "Real Climate" blog (2) , David Archer links to a rebuttal I wrote to oppose Andrew Revkin's "Dot Earth" dismissal of an article in the UKIndependent about dramatic new observations of methane emissions in the Arctic (3), Archer portrayed this rebuttal as an example of someone getting people un-necessarily "worked up" about the issue. As the co-producer of a documentary which has interviewed several leading edge scientists on this topic I have asked for space to respond. With all due respect to Archer, the result of these interactions has been a strong sense of urgency that stands in stark contrast to his dismissive stance. It is acknowledged that the Arctic is the most rapidly warming region on earth. As indicators point toward a near term loss of ice cover in the Arctic (with some studies pointing toward a late summer ice-free condition as soon as 2015 (4), there is a growing concern about how amplification of Arctic temperatures will affect the massive deposits of frozen methane in the shallow seabeds of the continental shelf areas. Researchers on the "front line" in the Arctic gathering empirical evidence - such as Igor Semiletov and Natalia Shakhova - are now reporting methane plume activity on a scale not witnessed before now. These observations were reported in the UK Independent and since that time have stirred up controversy as to whether humanity may be receiving a first glimpse of a situation that could escalate into one of the scenarios most feared by climate scientists - an unstoppable positive feedback known as a methane "runaway" event. This controversy has been reflected in the above-described exchange on "Dot Earth" and is now expanding to "Real Climate" and even more recently to Joe Romm's "Climate Progress". On Jan.11, Romm wrote about how the methane situation is combining with other factors to create an urgent danger in the Arctic (5). The twin issues of contention in this controversy have been whether the methane threat is real and whether it is imminent, therefore deserving the urgent attention of the world. Before launching into a discussion of those two points, it would seem useful to explore the larger context. A key question deserving exploration would be "what is at stake?" What are the potential consequences if humanity fails to pick up on warning signs and a methane runaway event becomes unleashed? The topic at hand is what most climate scientists would likely see as the worst case "nightmare" scenario which could lead to a total global catastrophe. We are talking about a greenhouse gas that has a full 72 times more powerful warming impact than CO2 within the first 20 years (6). We are talking about a global stockpile that contains as much carbon as all the world's known reserves of coal, oil, and natural gas combined. If there is even a chance that significant amounts might be released into the atmosphere by an unstoppable methane "runaway", a profound moral responsibility exists to approach the topic with utmost care and caution. Due to the enormous size of the methane deposits, this process would "feed" on itself in a way that humanity would most likely be helpless to stop. We are clearly dealing with a destructive force of almost unimaginable power, which underlines my earlier warning that it be approached with utmost caution. Are the Factors Present Which Could Lead to a Runaway? A) The incredible warming power of methane as a greenhouse gas (already quantified); B) The phenomenally huge volume of methane present in the continental shelf areas of the Arctic; C) The quite shallow depth of these seabeds, which allows direct venting to the surface and atmosphere (methane otherwise safely oxidizes in deep water); D) Their location in the most rapidly warming region on earth, where such is accelerating due to the "albedo flip" (open water now absorbing solar heat rather than having it reflected away by ice cover) and warmer water infiltrating at the river mouths; E) Direct observations confirming that large scale methane plumes are venting to the surface and into the atmosphere; and F) Direct observations confirming that seabed bottom temperatures are hovering at the thaw point (12). While it is not possible to pinpoint any particular time when a release of methane might hit "critical mass" and initiate the runaway, it certainly appears the necessary ingredients are present and a collision course has been set up. The question is no longer "if" but "when". With the Arctic warming so much faster than the rest of the world and arriving at such incredible temperatures within this century, it is clear that the "writing is on the wall" in terms of the future of methane in the shallow Arctic seabeds. Unless there is a major shift away from the "business as usual" scenario, it is inevitable that they will thaw and vent into the atmosphere. One of the top experts on Arctic ice - Peter Wadhams of the University of Cambridge in the UK - supports the PIOMAS sea ice volume model (16). melting and release of the methane." particularly vulnerable to climate change." could rival the rest of the fossil fuels combined." It is significant that Archer acknowledges that the potential exists for a large scale positive methane feedback to occur. Where we disagree is in our assessment of how serious and how urgent this threat is. Having acknowledged several key reasons why methane poses at least a very large potential threat to humanity, it is difficult to comprehend why Archer would set himself up as a naysayer and discredit those who see indications that this potential might soon become a reality. One of the ways he tries to do this is to point toward the possibility of natural geothermal warming coming up from below and ask the question: how do we know the plumes are coming from new, human-created warming? But this question severely misses the point and throws the conversation off track. 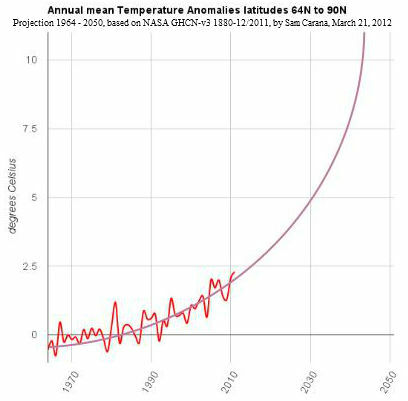 If indeed there is pre-existing warming coming from below, then this is only going to combine with human-made warming from above to create an even more volatile and dangerous situation. If the permafrost cap is becoming perforated (as suggested by Shakhova), then the hydrates may become subject to de-stabilization from both directions. bottom temperature in summer is 2 to 3 degrees above zero celsius (freezing). With methane-laden areas already so close to a thaw point, it becomes a critical question to determine how rapidly the temperatures in the Arctic will increase. Once the ice cover undergoes collapse, there is nothing to prevent an escalation of Arctic warming. Under the business as usual scenario, we are seeing stunning projections of how warm the Arctic could become within this century - such as the M.I.T. study. These projections create a collision course whereby currently frozen methane will inevitably thaw. Now a strong case emerges that ice loss could happen even more rapidly than originally speculated, expanding the same open water that Semiletov says is driving warm temperatures downward to the seabed. 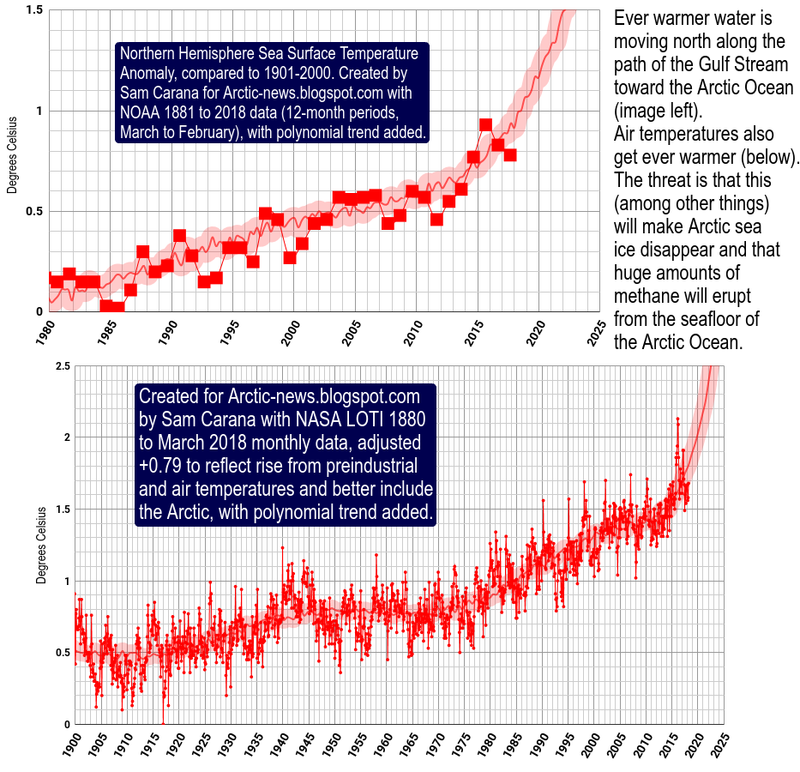 With such a prospect of a warming Arctic releasing the colossal methane deposits, how does Archer defend the case for complacency? As it is the definition of "runaway" that such a feedback will be all but impossible to stop once it starts, the only option for humanity is to act preventatively. When Archer continues the quest for some kind of absolute "smoking gun" evidence that the methane emissions now occuring are being caused by human-made warming, it seems he is having difficulty - as many of us are, including myself - in grasping the full meaning of the concept of IRREVERSIBILITY. This quest is wrong not only for the reason shared earlier but because at the point this causal connection may well become unequivocally "proven", it is highly possible that the runaway will have already been triggered and therefore too late to stop. There will be no chance for a do-over here. For those who advocated complacency and were wrong, there will not be an opportunity to reverse course. With all respect, I must ask why make a gamble that could lead to such unspeakably tragic consequences? The incomparably more relevant question to ask is whether the factors may be lining up that could bring on a runaway, and what our societal response should be if they are. We are obviously in a situation where time is of the essence. There are also two other factors that come into play. Huge amounts of fossil fuel industry money are backing orchestrated efforts to discredit climate science in general and most certainly any sense of urgency. In addition, many people are struggling with a very natural form of psychological denial that blocks us from seeing how close humanity may be to oblivion. I have no reason at all to doubt the sincerity of Archer and believe his stance to be genuine. But when a scientist on a blog as respected as Real Climate downplays urgency, it can inadvertently be used as fodder to support both of these factors. Such a stance can be amplified by the blog universe (such as Scientific American as well as many denialist sites) to give an impression of a "consensus" in the scientific community when this is emphatically not the case. Archer is delivering a message of complacency (what Joe Romm refers to as "pushing the snooze button" (23) ) at precisely the moment when humanity must be heightening its vigilance to avoid passing a point of no return. A methane runaway would qualify as a planetary emergency. It is the view of a growing network of concern that several factors are combining which point toward the near term potential for such to develop in the Arctic. Rather than discredit such concern, humanity would be much better served by a rigorous scientific inquiry that could confirm whether there is merit to it. Igor Semiletov, involved in cutting edge field research on methane emissions, has informed this writer that much more could be accomplished with expanded funding support. I call upon Archer and all Real Climate contributors to vocally support an immediate and high level escalation of research aimed toward "getting at the facts" on potential runaway - no matter where they lead. As the stakes could not be higher, it would be unspeakably tragic if world governments failed to provide such and the situation evolved to a point where a catastrophe spun out of control. The concept of geo-engineering has attracted a spectrum of opinions ranging from support to opposition and many shades in between. However, there is a fundamental reality staring in our face. If humanity waits until the point of no return is crossed and a runaway is unleashed, it will be too late to develop any such options. In the opinion of this writer, the prudent position is to work now on developing safe geo-engineering options so that there might at least be a chance to implement them should the world become convinced that a runaway is imminent. In the case of methane, we are not dealing with a dramatic image of an atomic fireball and its capacity to render immediate destruction. But extended over a longer range of time, the global devastation it would inflict would be no less sweeping. The spectre of a methane runaway is real and it is an existential threat to humanity. In our society, the scientific community holds a position of great respect. In order to protect scientific "objectivity", our tradition has been to separate the institution of science from the realm of public policy. I do not call upon Real Climate to violate its internal agreement and issue specific policy directives. However, I do call upon it to release a generic warning to policy makers that humanity must break out of its state of denial, recognize that the laws of physics do not operate on a political calendar, realize we are dealing with a powerful force that can spin out of control, and therefore quickly educate ourselves as to the severity of the threat. It is my hope that Real Climate - as well as the larger community of climate scientists - will rise to the occasion and show the way. 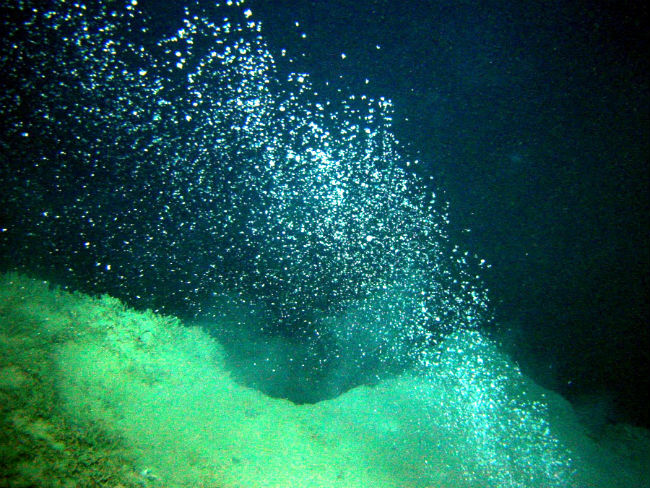 Could Thawing Methane Trigger Runaway Global Warming?" 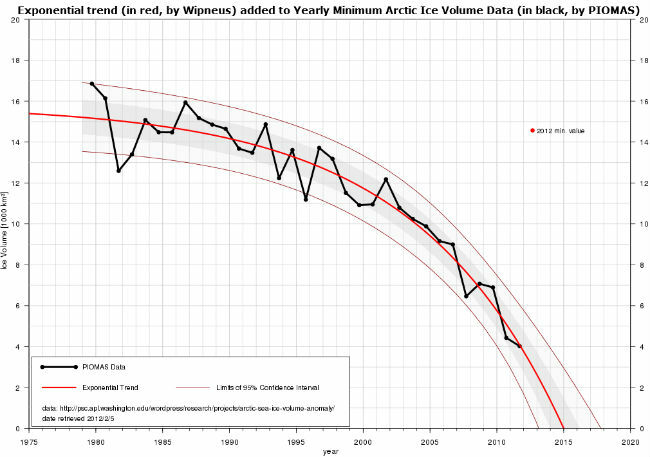 Arctic sea ice volume decline graph by Wipneus based on PIOMAS data. (7) Documentary interview with Leifer www.590films.org/methane.html , (in progress); the crew has interviewed climate scientists Igor Semiletov and Natalia Shakhova (Internat'l Arctic Research Center / IARC at the Univ. of Alaska - Fairbanks), Ira Leifer (Marine Science Institute at Univ. of Calif.-Santa Barbara), Vladimir Romanovsky (IARC), and Katey Walter (Univ. of Alaska - Fairbanks). On geological history and extinction events, paleo-climatologists Michael Benton (Univ. of Bristol in UK, author of book When Life Nearly Died) and Andrew Glikson (Australian National Univ. in Canberra). Also in consultation with Peter Wadhams of the Univ. of Cambridge - one of the top Arctic ice experts in the UK.